Fuel prices jump as rupee hits another low, driven by rise in global crude prices and political uncertainty. How do these factors impact the national economy, what are India’s options for addressing the situation? The Indian rupee, which hovered around 68.50 to a dollar until a month ago, suddenly went into a decline, falling by nearly 4% over the last one month leading to the low of 71.21 Monday. While rising crude oil prices were already having an impact on the rupee, a free fall of the Turkish lira following an economic crisis in that country impacted emerging economy currencies, which lost ground against the dollar. Concerns over US-China trade talks, too, have had an impact on emerging market currencies over the last couple of months. A weak rupee not only hurts the country and its importers on account of a higher import bill and current account deficit but also tends to be inflationary. The situation will be keenly watched by the Reserve Bank of India. Why have crude prices gone up? Concerns around US sanctions are a rising threat to oil supplies, leading to a spike in crude prices. While Brent crude was trading at levels of $80 per barrel in May, the prices softened over the next two months as the major oil producers, at their meeting in Vienna in June, decided to ramp up production. Although prices remained volatile and hovered between $70 and $75 per barrel between June and August, they have risen particularly sharply over the last couple of weeks to hit $78.12 Monday. While there are disruptions to crude supply from Iran and Venezuela, there is widespread concern that the global oil market will get squeezed over the next few months as US sanctions restrict crude exports from Iran. Even as Saudi Arabia and some other major oil producers could raise their output, the market feels that it may not be enough to offset declines in Iran, Libya and Venezuela that are grappling with crises. The situation is expected to remain tight and oil prices may continue to rule high. How do higher fuel prices impact the economy? INFLATION: High fuel prices have a direct bearing on the non-food parts of CPI (Consumer Price Index) and WPI (Wholesale Price Index) inflation and it may have a bearing on the RBI’s decision to go for another interest rate hike in its efforts to contain inflation. “RBI would have to take action on interest rates and there would definitely be another rate hike of at least 25 bps (basis points). It is, however, open to conjecture whether this would be taken as a preemptive measure or a remedy for higher inflation,” said Madan Sabnavis, chief economist at Care Ratings. 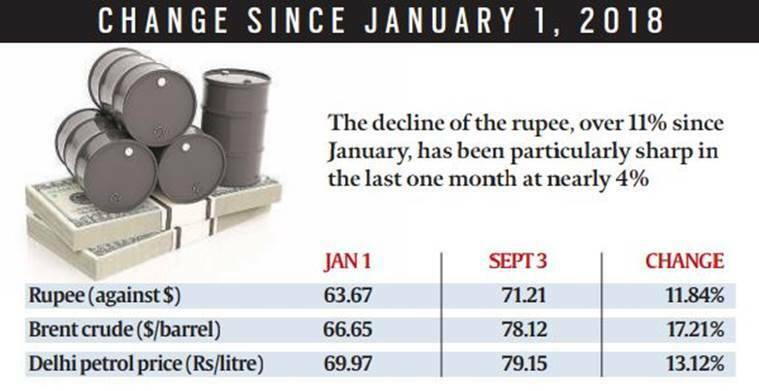 There is nothing the government can do to check the rise in global crude oil prices, nor can it do much to check the fall of the rupee as it is driven mostly by external factors. The RBI, however, intervenes intermittently to check excessive volatility in the currency market. A report released by Care Ratings notes that while the government can go for a reduction of excise duty or VAT by central and state governments to bring down the fuel price burden on consumers, “it would mean lower revenue collections. In July ’18, the consumption of petrol and high speed diesel stood at around 8,900 thousand tonnes. If the excise duty is reduced by Rs 1/litre it might lead to reduction in revenue collections of around Rs 7,000-8,000 crore on an annualized basis”. CURRENT ACCOUNT DEFICIT: This is a measure of country’s trade, when the value of goods and services it imports exceeds the value of goods and services it exports. The current account also includes net income, including interest and dividends, and remittances. A high CAD can create macro-economic vulnerability in an economy, especially affecting stability in currency markets. India’s CAD is typically vulnerable to any rise in international crude oil prices as the country imports around 85% of its oil requirements. Rising global oil prices, when coupled with a sharp depreciation in the rupee, creates a double blow for the CAD as the country’s import bill spikes even though the volume of import may remain the same. CAD is measured as a percentage of the Gross Domestic Product. In 2011-12 and 2012-13, when oil prices shot up and the rupee fell, India’s CAD jumped from 2.7% in 2010-11 to 4.2% in 2011-12 and 4.7% in 2012-13. Since 2013-14, when international crude oil prices started declining sharply, the CAD too fell in tandem, to 1.7% in 2013-14, 1.3% in 2014-15, 1.1% in 2015-16 and a low of 0.6% in 2016-17. In 2017-18, with the increase in oil prices, the CAD jumped to 1.9% in 2017-18. The widening of the CAD was mainly due to a higher trade deficit brought about by a larger increase in merchandise imports relative to exports. India’s trade deficit increased to $160.0 billion in 2017-18 from $112.4 billion in 2016-17. In 2012-13, when the CAD shot up to 4.7%, India had to resort to severe restrictions on gold imports and raise foreign currency deposits at higher rates to protect the macro-economic health of the country. Going forward, should a similar situation arise and the rupee continue to depreciate, the government could look at raising funds through issuance of NRI bonds to stabilise the currency.